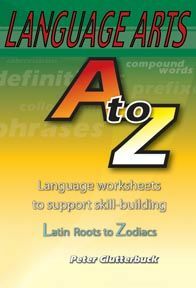 Description: These self-contained worksheets can be used in class or for homework to support language practice and reinforcement. The contents are organized using the 26 letters of the alphabet and cover more than 120 English-language topics. Examples include Abbreviations, Acronyms, Adjectives, Adverbs, Antonyms, Homophones, Idioms, Metaphor, Simile, Parts of Speech and much more. Worksheets are clear, engaging and easy to use.